Get Neofeud before it's release on Steam and get the Neofeud bonus content (2 1/2 hour soundtrack + Neofeud in ebook-form) FREE! Plus you get a Steam key once it's available there! An original dystopic sci-fi world and story that will (hopefully) make you question some of your core beliefs. Tricky yet satisfying, point-n-click detective work, interspersed with tense action shootouts. Endless bombardment of witty one-liners from hardboiled cyberpunk. A work-in-progress on a potential protagonist. This took me a long, long time. I think the only background that's ever taken me longer was The Neofeud Sky Palace. 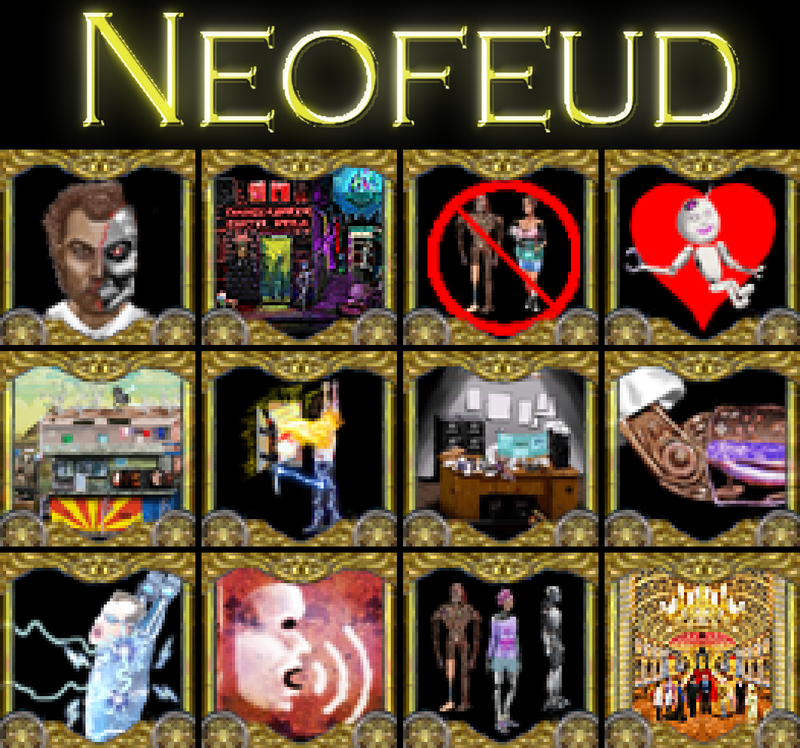 Hi guys, just an update for you all: Neofeud's bonus content is free with the game until June 13! Hey guys! So the big news is Neofeud is just $10 for the next week! You'll also get a Steam key for free when Neofeud hits Steam, September 19th! That's right, at long last, Neofeud will be coming to Steam September 19th! 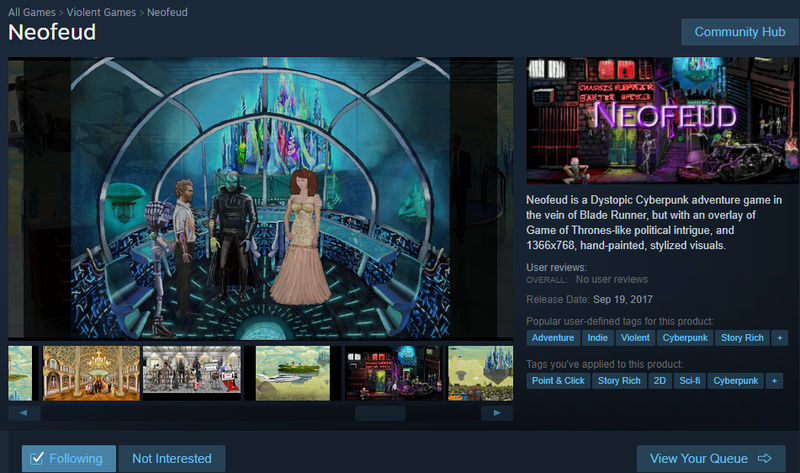 As I am a one-person indie developer, I'm my best to get the word out about Neofeud for the Steam release, but have basically no marketing budget. So, proceeds from the Itch.io sale will be used to help pay for publicity of Neofeud's release, and app submission fees for the next Silver Spook Game! I'm hoping to raise at least $200 which would help to cover the costs of some social media promotions, as well as the $100 submission fee for the next Silver Spook game, Dysmaton. 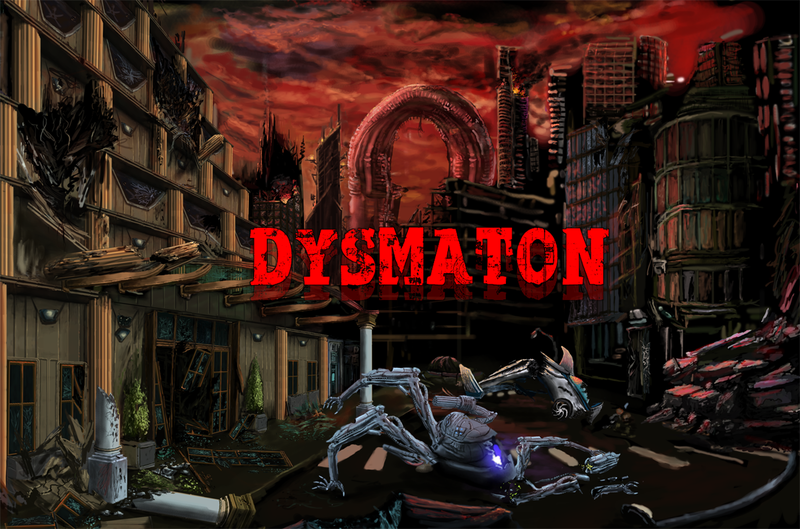 Simultaneously, I've also been working on writing the game story for Dysmaton, creating art assets, and implementing into the game itself as well. While I am somewhat used to taking on many or all of the jobs of game development, at this point I notice that working on successfully rolling out a game, and handling the business and marketing end of it, whilst trying to develop *another* game is proving to be the straw that's breaking this camel's back. Which is one reason why I'm hoping this Itch.io sale will be able to raise a reasonable amount of funds that I could then use to pay for help with the business and marketing end, as I basically have zero budget that isn't earmarked for groceries, the roof over the family's head, and other essentials. 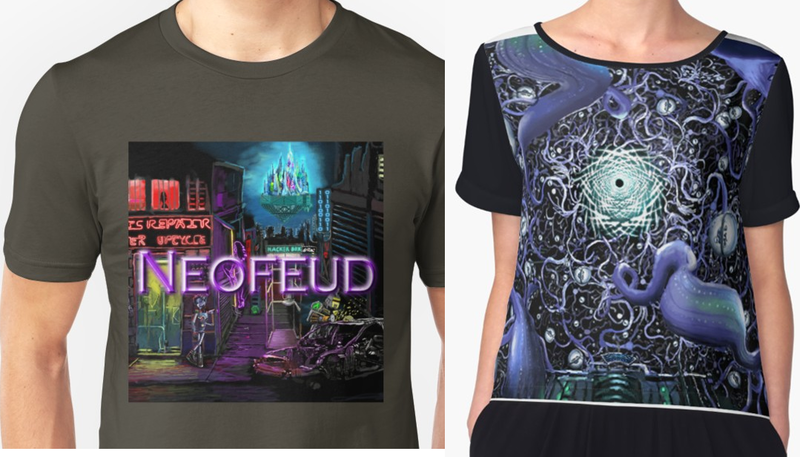 So if you were considering picking up Neofeud at some point, now's definitely the time, and I'd greatly appreciate it! If you're an indie game developer, a cyberpunk or science fiction writer/fan, or generally just a cool person, definitely hit me up, as I'd love to talk to you! Neofeud is now on Steam! This looks awesome, love the art style! 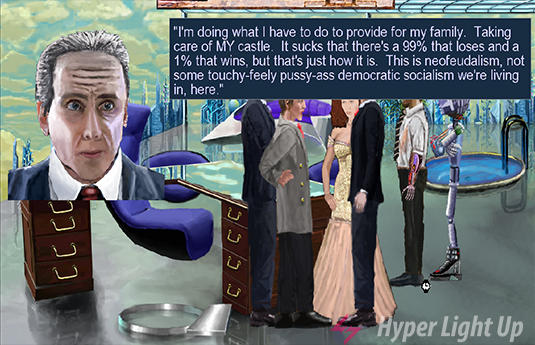 Beginning by introducing the main character of the story, an ex-cop and currently social worker named Karl Carbon, the story of Neofeud quickly explodes into a story rife with psuedoscience and more twists than an M. Night Shamlyan movie. As a single conspiracy unfolds, others follow, creating a story layered so deep that by the halfway mark of Neofeud’s potential 15-hour game time I found myself questioning characters motives even more than the main character of the game itself. Read the full review from Sprites and Dice. 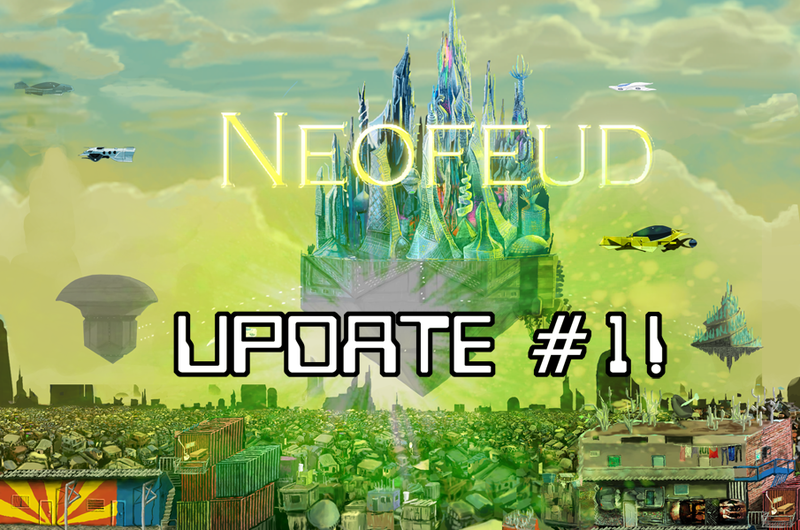 Neofeud Update #1 is here, making it a better, smoother game! Hey cyberpunks, humanoids, Neofeudal lords and ladies! 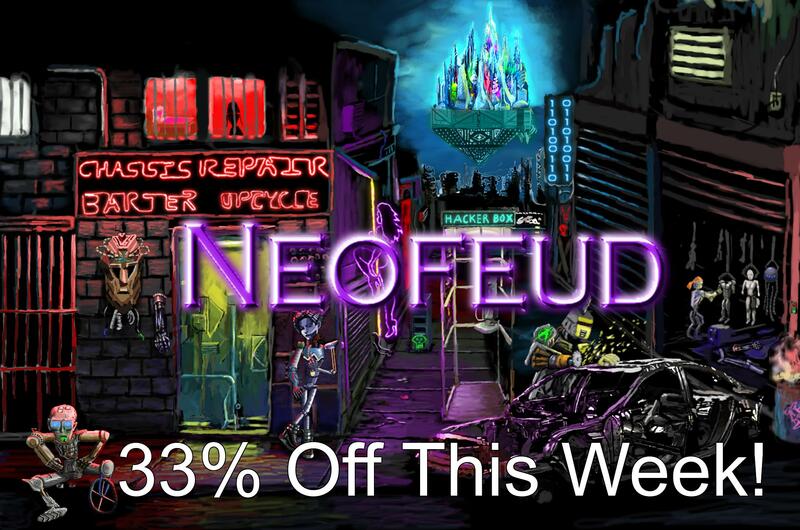 Neofeud is just $9.90 for the next week! If you've been considering picking it up, now would be a great time! 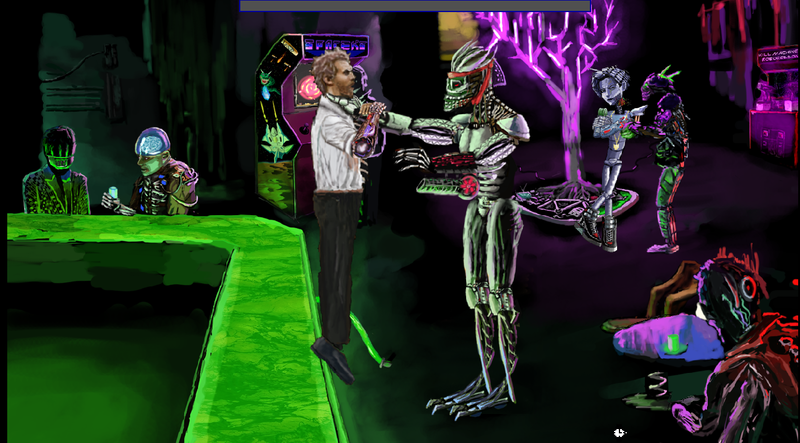 Neofeud is the debut game of native Hawaiian, Christian Miller. It’s an ambitious project, drawing on personal experience as a STEM teacher for underprivileged kids in Honolulu as well as a wide array of popular sci-fi films and books. The aesthetic is heavily skewed towards Blade Runner or The Fifth Element, while the story is reminiscent of Fritz Lang’s Metropolis and the film version of I, Robot. Players take on the role of Karl Carbon, a police officer turned social worker. I was immediately hooked by this detail. I had expected to play a character akin to Decker in Blade Runner; a sort of rogue-cop with good intentions. There are definitely cop-like qualities about Carbon, but he’s a social worker through and through. And this makes for a compelling story, and some truly heartbreaking gameplay. Drawing from personal experience, Miller has delivered us a story that is so much more than “humans vs. automations.” Carbon has cybernetic enhancements, but they’re obsolete and he can’t afford to replace them. He works with AIs and robotic entities that society has deemed “defective” and “unhireable.” He understands what it’s like to be cast aside and denied resources at every turn. 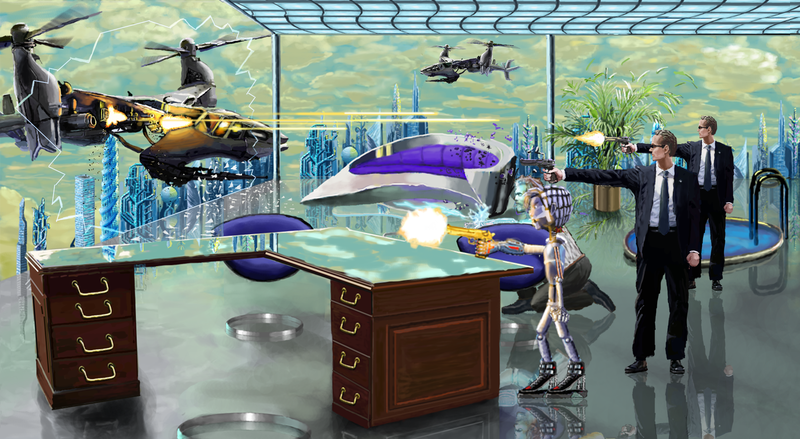 Neofeud takes place in a dystopian future where faulty sentient robots and failed human hybrids form the bottom layer of society, while neofeudal lords live carefree in luxurious floating cities. The extensive storyline is very political, but also full of action and really entertaining. This game is an impressive piece of work, since it’s quite excellent on many facets. This spectacular and complex story will take at least 12 hours to play through, and the writing is excellent and enjoyable. The characters are fun, the setting is really interesting so you’ll want to learn more about it, and there’s always so much happening which makes you want to continue playing to see where the story will take you next. 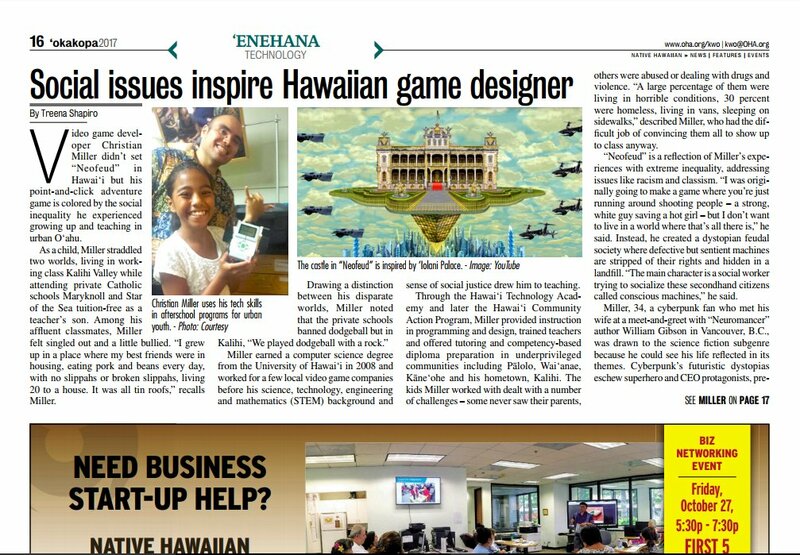 In addition, check out this awesome article on Silver Spook Games and Neofeud in Hawaii print publication Ka Wai Ola! This article is actually included in the Honolulu Star Advertiser, the biggest Hawaii newspaper, which is a pretty cool honor! Want to see how I make these games? Come hang out! I livestream every Saturday around 4 PM EDT! "Do Androids Dream Of A Fulfilling Future?" The path for humanity into the future is looking increasingly uncertain in 2017. Numerous events, from the financial crisis, the rise of automation, global warming to the election of a certain so-called President, brought about a strong sense that the world is not heading in a great direction. Neofeud takes this bad path to one potentially terrifying extreme. It imagines a world where the development of artificial intelligence and increasing automation does not result in a post-scarcity economy and the establishment of fully-automated luxury communism. Instead, AIs, augmented people and robot-human hybrids become a new underclass destined for menial work, exploited to an even greater extent by the richest 1%. The elite have become so unimaginably wealthy they are literally able to construct castles in the sky, lording it over the huddled masses below. Quite pointedly, the world has regressed back to a “neofeudal” system, where indentured citizens work for minimum remuneration in the service of the landed gentry. 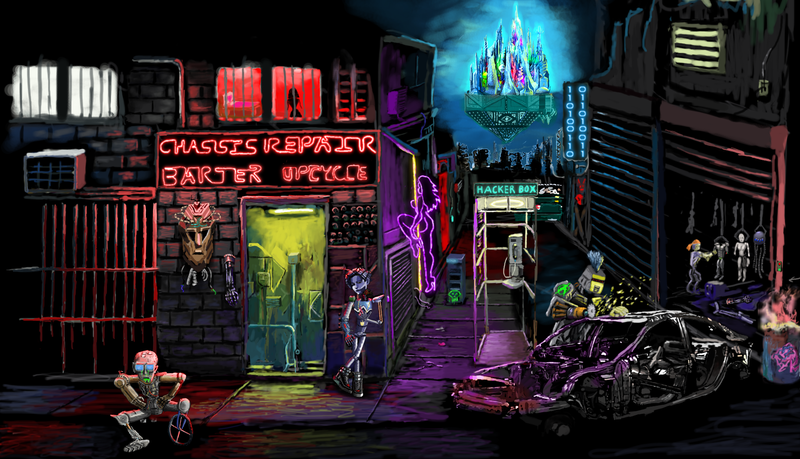 It is into this fractured world that we are dropped in Neofeud, a new adventure game from Silver Spook Games. 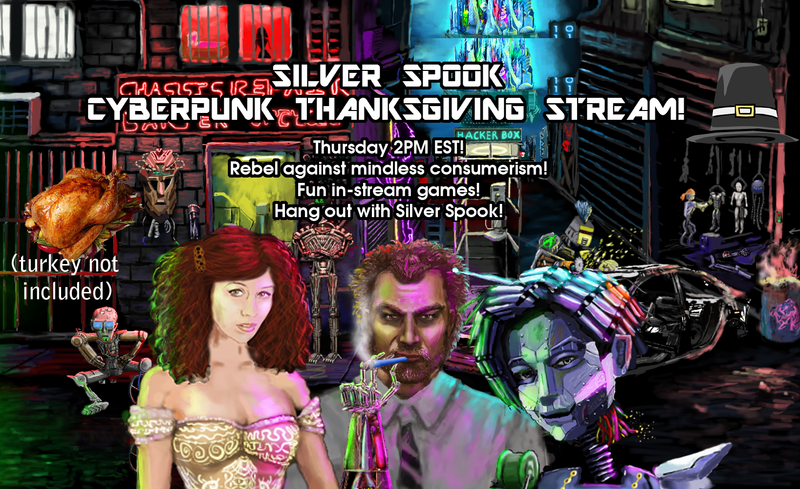 Silver Spook Live #25 - Silver Spook Cosplays a character from Neofeud! And re-enacts some scenes from the game in this Halloween special. An adventure that will offer you many hours of play and it will make you think about our world and where it is heading. Not many indie games do that, and it is really important. Hey guys! 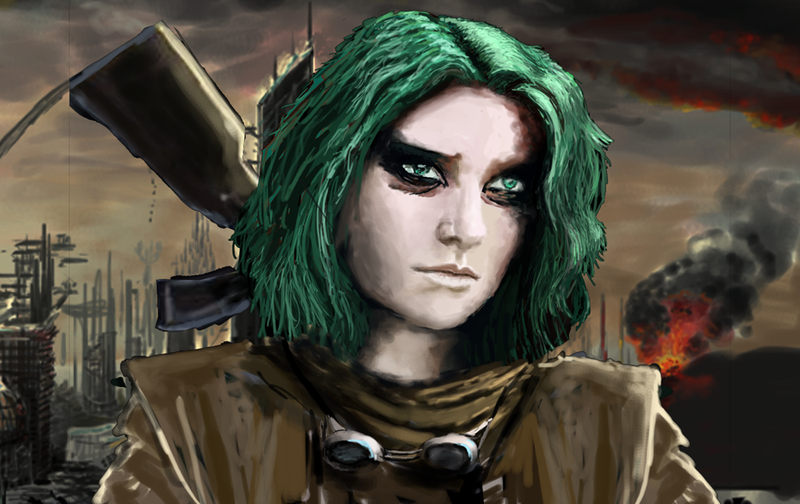 So I have recently had the pleasure of talking to Mark Yohalem, writer of the Wadjet Eye point-and-click adventure game Primordia for my podcast, which does involve talking about Neofeud and the state adventure games generally speaking. "In this episode, Silver Spook speaks with Mark Yohalem, writer of Primordia, a legendary sci-fi point-and-click adventure game and a big inspiration behind Neofeud. Mark and yours truly discuss the State of Adventure Games which somewhat resembles that of Schrodinger's Cat (never quite alive or dead! ), Primordia and the making thereof, Mark's exciting new 'mythological, mid-apocalypse RPG' in development with Wormwood Studios, some insider game-dev shop-talk, Unity vs Adventure Game Studio pros and cons, Mark's and my favorite cyberpunk, the difference between depressing and melancholy, the psychological selling-points of post-apocalypses, why appellate lawyers may be cannibal shishkebabs in said apocalypse, and much more!" So first off, Neofeud is 33% off this week on Steam! And the big news is I will be streaming live on my Youtube channel on Thanksgiving at 11 AM Pacific Time! Come hang out! In addition to the above mentioned hijinx, I will also likely be doing a bit of gamedev and making some announcements on the upcoming Silver Spook Games projects. No turkeys were harmed in the making of this poster! Next up, I am happy to announce that I am currently in the process of porting Neofeud to Mac, and have a potential solution in the works! I can't give any specific dates on a release, but it is definitely in the pipeline. In this episode, Silver Spook speaks with Jamie Patton, creator of Spinnortality, a groundbreaking cyberpunk game in mid-Kickstarter. Cyberpunk strategy/management game. In Spinnortality, you, "Run a global megacorporation. Manipulate culture, destroy governments and become immortal." 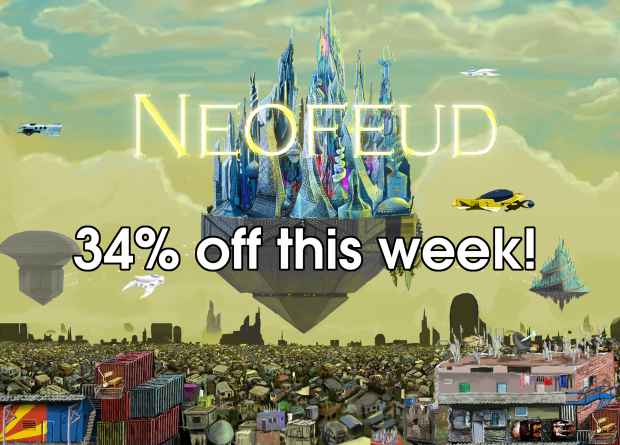 And Neofeud is still on sale for a few more days! 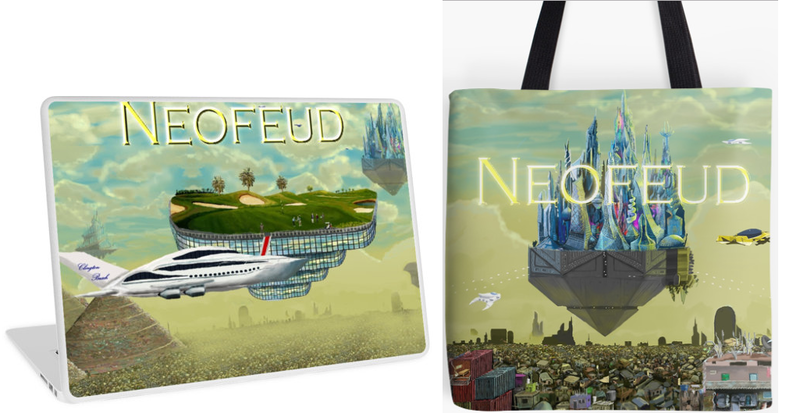 Today is the last day to get Neofeud on sale! 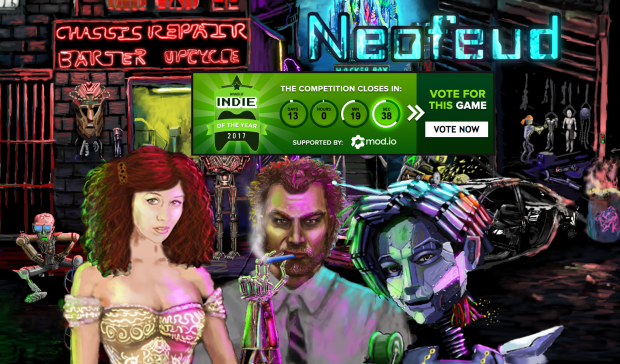 Hey guys, if you have played and liked Neofeud, please consider voting for it for "Indie of the Year" on IndieDB!